It’s a very nice version of “our” panellets -I’m catalan! 😉 – If you really want to try them you should come to visit us around “la Castanyada”, the autumn party we celebrate on final october or the first of November (Dia de Tots Sants). The “panellets” are the traditional catalan cakes for this festivity (it’s not a Spanish thing, they don’t really make or eat them). It’s funny how we all use to celebrate the same kind of festivities in such a different ways, right? Glad that I have the stamp of approval from an expert 😉 I should perhaps have spotted that they are not Spanish – I’m from Scotland, and there are many Christmas and New Year traditions that we do which are not common in the rest of Britain. I served these at the weekend with some Christmas drinks, they were one of the first things to vanish completely, clearly they are a hit in London! These sound delicious. i think I’ll try them for Christmas! Thanks! Hi Kerry – glad you like them, they were delicious and one of the first things to completely vanish from my drinks party at the weekend. I think they would look beautiful with a large plate with different jam flavours (raspberry, quince, blackberry, apple, orange…). Russell, I also really liked the idea of rolling them in pignoli nuts; we are Italian! I’m actually going to the supermarket today to pick up the ingredients, I’ll let you know how they turn out. I also wanted to let you know that I LOVE your website. It’s really a great subject and your content and look of your website is terrific. Just this week I created my own wordpress website at http://www.trustingtraveler.com My goal is to provide families everything they need to enjoy a life rich in culture and travel. My interest in your website is of course food, since it plays such a big part in cultures. I am about to add a link to your site under my “other worthwhile links” page. I hope that is okay with you. I’ll do that now. I hope you approve. Hi Kerry – glad you like this recipe, and good to hear that you are trying it out! Good luck with the pine nuts version – do let me know how it works! Thanks for adding a link on your site – very happy to do that, and I hope that some of the content is interesting to your visitors (and I’m glad I’m deemed “worthwhile”!!!). 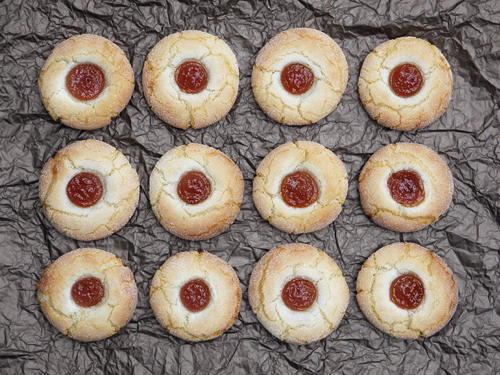 Thanks – I have to say, they were one of my favourite bakes this year. Glad you like it too.